German family owned spirits company Waldemar Behn will launch the precious new design for its Dooley’s Original Toffee Cream Liqueur to its customers at the TFWA Asia Pacific Exhibition & Conference in Singapore. The response to the new design at the TFWA World Exhibition in Cannes and the IAADFS Duty Free Show of the Americas for Dooley’s, the most awarded cream liqueur in the world, was overwhelmingly positive. 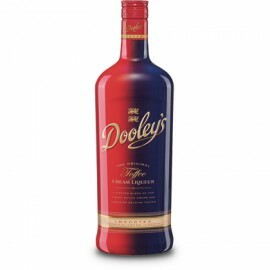 The new presentation of Dooley’s has already been listed in Thailand and the UAE. “We are so proud to have confirmed that Dooley’s will be with King Power in Thai Airports from this summer and with our partner Interworld in Beirut and Truebell in UAE,” says Torben Vedel Andersen, Global Sales Director. “We look forward to displaying the Dooley’s family alongside our global duty free core brand DANZKA Vodka,” said Rüdiger Behn, Managing Director, Waldemar Behn GmbH. Dooley’s continues its tradition of more than fourteen years to win the highest awards around the world, recently winning the Gold Medal at the World Spirits Award 2014 as well as Double Gold Chinese Wine & Spirit Award. These awards are in addition to the Gold Medal in October from the Cathay Pacific Hong Kong International Wine & Spirit Competition honoring Dooley’s Original Toffee Cream Liqueur and a Gold Medal at the 2013 LIQUEURS MASTERS in the cream segment in November. The Cathay Pacific committee highlighted especially the outstanding taste and uniqueness which is seen as the benchmark in the cream- liqueur-category. The “Beyond luxury” theme of the new Dooley’s presentation perfectly fits the new design, the extraordinary content and the fantastic artwork of the new Dooley’s visuals. To complete the “beyond luxury” experience, Waldemar Behn will be relaunch the new website www.dooleystoffee.com at TFWA Asia Pacific Exhibition & Conference in Singapore to showcase the award-winning liqueur. Dooley’s is currently available in Original Toffee Cream Liqueur, a superb blend of Belgian toffee, Dutch Cream and Vodka, Dooley´s Espresso, a magnificent blend of Dutch Cream and Italian Espresso, as well as new seasonal flavor Dooley’s Winter Chocolate, which joins Dooley´s Tropic Summer. In Singapore Dooley’s Cream Liqueurs will be featured on the Waldemar Behn Stand D34.